Anstis Court is a development of modern apartments located on Woolbrook Road and is conveniently situated nearby to local amenities, which are a short walk away. Flat 3 is a ground floor apartment which is presented 'unfurnished', is decorated to a neutral colour scheme throughout and has two double bedrooms (the master with an en-suite shower room), a bathroom and an open plan kitchen/sitting room with a breakfast bar. The property benefits from uPVC double glazed windows throughout, gas fired central heating and a single parking space. Outside the sitting room is a communal garden area for seating. Flat 3 is located in block 1-9 Anstis Court, which is the building facing Woolbrook Road. From the main communal entrance door a further door leads to the ground floor entrance hall, where the front door to Flat 3 is located. Coved ceiling. uPVC double glazed window from the kitchen with a westerly aspect. A modern, attractively fitted kitchen comprising a range of floor standing and wall mounted cupboards with cream 'Shaker Style' doors. Co-ordinated worksurfaces. Cream tiled splashbacks. Stainless steel sink with integrated waste disposal unit. Built in Neff electric double oven. Built in Neff four burner gas hob with extractor over with light and variable fan speed. Integrated 'Tower Style' fridge/freezer. Integrated Neff dishwasher and washer.dryer. Inset ceiling spotlights. Ideal gas fired combi boiler for heating and hot water. Breakfast bar. Laminate floor. 5.1m (16'9") x 3.6m (11'9") Coved ceiling. Laminate floor. Radiator. TV point/Sky point. Honeywell central heating and hot water programmer. uPVC double glazed door with curtains to a communal courtyard area for seating which enjoys a westerly aspect. Coved ceiling. Neutral decoration. White suite comprising a low level WC, wash basin and pedestal with tiled splashback with light and shaver point over and fully tiled shower cubicle with a glazed pivot opening door and Mira Excel thermostatically controlled shower. Vinyl floor covering. Inset ceiling spotlights. Extractor fan. Radiator. Coved ceiling. A modern white suite comprising a low level WC, pedestal wash basin with tiled splashback and a panelled bath with fully tiled walls over, an attractive border and a bath/shower mixer tap. Vinyl floor covering. Radiator with thermostat. Inset spotlights. Ceiling extractor. Mirror fronted medicine cabinet. There is a SINGLE PARKING SPACE conveyed to this flat, which is located at the rear of the development and is adjacent to the front door of the block. 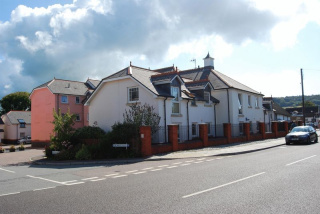 We are advised by East Devon District Council that the council tax band for this property is band C.
Rental: £695.00 per calendar month (payable monthly in advance) Deposit: £695.00 (payable before signing the Tenancy Agreement) Tenancy Type: Assured Shorthold Term: 6-12 months initially, And long term. Available: 22/3/19. Restrictions: No DSS. No Smokers. No Pets. Children considered at the Landlord's discretion. No Sharers. We will require two forms of identification, namely a copy of your passport and/or birth certificate and/or driving licence. The tenant is responsible for the payment of electricity, telephone (if applicable), water rates, council tax and for registering with the relevant service providing authorities. The tenant is responsible for the cost of preparing the Tenancy Agreement and inventory of £160.00 inc.VAT. Upon signing the agreement, the tenant will be required to lodge the deposit. 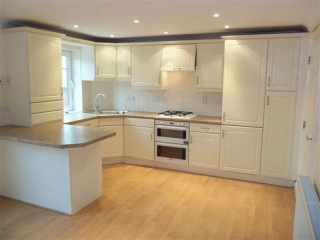 This will be returned at the end of tenancy subject to the property being left in its original condition. There will also be an additional charge of £90.00 per person for taking up references, payable upon rental application. All our existing tenants are told not to allow casual callers to enter the property on the grounds of safety and this includes people carrying our letting particulars, please therefore do not call at a property without an appointment as you will not be allowed to view it. Please contact Harrison-Lavers & Potbury's for an appointment.